An activist flying into Japan hoping to document the annual dolphin and whale slaughter in the infamous cove in Taiji was detained by officials at Tokyo's Narita Airport and eventually forced to leave the country. Melissa Sehgal, an activist affiliated with Sea Shepherd Conservation Society who has documented the slaughter for four years now, says that she was questioned for nine hours and detained for 24 hours in a holding cell. She was then reportedly escorted onto a flight and forced to leave Japan. Sea Shepherd says that several of their other staff and volunteers have been denied entry to Japan this year as well. Japanese immigration authorities say that they are not technically "tourists," and in violation of visa restriction. The incident has not been reported in any Japanese news sources, and government representatives have not officially commented. "Since when is taking pictures of what Japan contends is their 'culture' not considered a tourist activity?" said Sehgal. "Japan is so ashamed of their serial killing and kidnapping of wild dolphins that they are trying to stop activists like me from showing the world the truth. It is a testament to our effectiveness that they are trying to keep us out." Last year Ric O'Barry, former dolphin trainer and head of the Dolphin Project, was turned away when he tried to visit a juvenile albino calf after she had been captured. When he was denied entry by the park's staff at the gates, O'Barry sued the marine park for discrimination. "They don't want people like me to go into the Taiji Whale Museum to monitor Angel," O'Barry told AP last May in Tokyo. Meanwhile in Taiji, the drive hunt season continues. 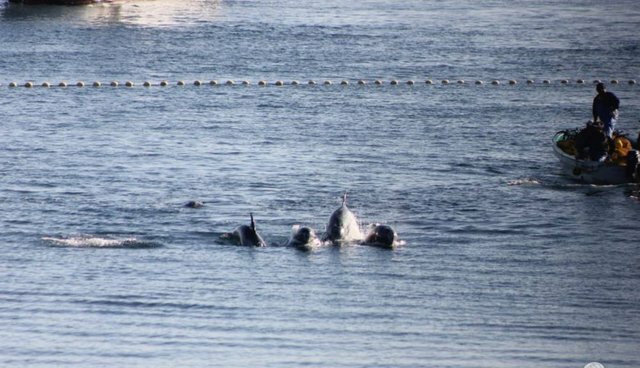 Just this week, a pod of some 50 striped dolphins was ushered into the cove and slaughtered for their meat. 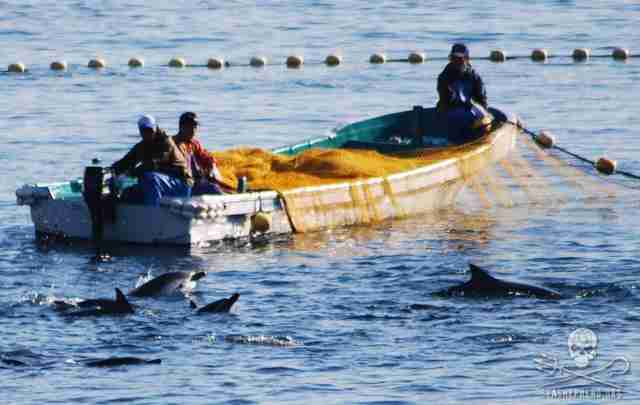 Since Sept. 1, 20 pods of dolphins, nearly 300 total, have been killed in the cove.